Check out our very own Raini Keyser, featured in Ahwatukee Foothills News! Raini Keyser helps wine aficionados keep their bottles safe while expanding their knowledge of the fruit of the vine. Less than two years after opening, more than half the wine lockers are being rented by members at the Chandler operation, located on West Queen Creek Road. Cellar manager Jared Silverman describes it as a “wine club” that gives members a wide range of services. They can safely store wine in lockers in a cellar where temperatures are kept at 55 degrees with between 60 and 70 percent humidity, which are ideal conditions for preserving the beverage. The company, named after the Latin word for wine, also gives members access to exclusive opportunities to buy wine, as well as tasting events the public would rarely be able to attend. In Vinum 55’s Wines of the World program, members can soak up knowledge about wines, including facts about the grapes, geography, soil science, history, climate, culture and wine-tasting techniques in that region. Vinum 55, which also has locations in the Scottsdale Airpark and north-central Phoenix, also does a complete inventory of members’ wine, making details about their bottles accessible on an app called CellarTracker. The company will accept wine deliveries for its members so the bottles do not sit outside in the hot sun or other damaging weather conditions when they are not home. As part of its concierge services, members can have wine delivered to their homes or businesses. Vinum 55 also offers logistical help for those moving so their wines stay secure in temperature-controlled vans. Of the 200 wine lockers in the Chandler Vinum 55, located next to Press Coffee, 115 were rented as of mid-December, Silverman said. The Chandler operation had 162 members as of that date. Members may come to Vinum 55 any time it is open to have a glass or bottle of wine with their family members, friends and business colleagues in the tasting rooms. The tasting room may be reserved for private events. A social membership at Vinum 55 in Chandler costs $65 a month and gives clients a locker/personal wine vault in the cellar to store 12 cases, or 144 bottles, of wine. Customers who pay for a year’s membership up front get a month for free. The cost for a guest of a member to attend a Wines of the World event is $45, but Vinum55 members can bring a guest for free to the wine tastings. Storing up to 24 cases of wine costs $125 a month. 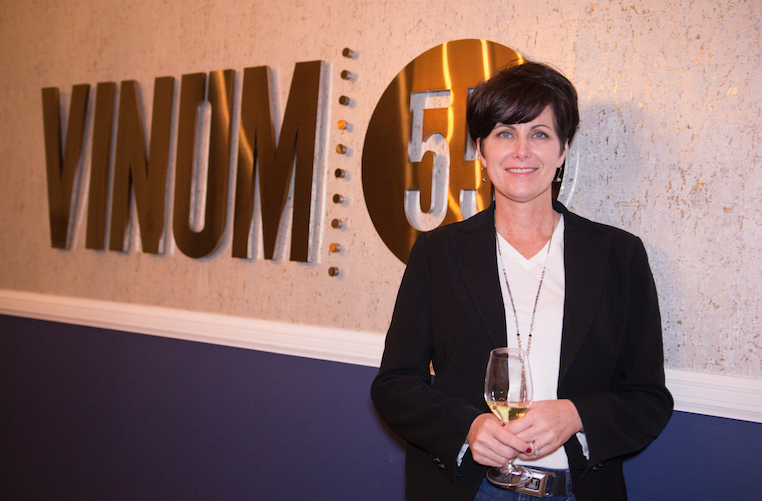 Vinum 55 can “accommodate a wine collection of any size,” Keyser said. The prices differ at each of the three Vinum 55 businesses and depend on the size of the locker and the location. For additional dues that Vinum55 did not want to disclose, members can buy concierge services, including having their wine delivered to them at a home or business. Assisting members with moving outside Arizona is also an additional, concierge service. Members also can rent a rooftop area at Vinum 55 in Chandler for special events if they give 45 to 60 days notice. “The social aspect is huge, but also, people have less room in their homes but they also love wine,” Keyser said. She said most members are over 40, but that some are in their 30s. They are upper middle class to affluent and many form friendships through Vinum 55. Some are just learning about wine while others are already knowledgeable. Usually, about 40 people gather for the wine tastings and 25 to 30 folks attend the Wines of the World gatherings. Several events are held every month at Chandler Vinum 55. Wines from California, Oregon and Washington state are popular among members, Keyser said. Everyone on staff is highly trained in wine, said Keyser, who is a certified specialist of wine through the Society of Wine Educators. To earn that certification, one must pass a rigorous exam that tests knowledge of wine and mastery of major elements in the worlds of wine production and the science and study of grapes. Cellar manager Silverman has a level one sommelier degree from the Court of Master Sommeliers, Americas. That is a certification for which wine and hospitality professionals complete a thorough study of wines and spirits and undergo an intensive review by master sommeliers on their knowledge of wine and spirits, proper wine service as well as deductive tasting. Staff members involved in the wine tastings and Wines of the World seminars all have at least the level one sommelier degree or an equivalent wine degree. Silverman creates and teaches the Wines of the World seminars at the three Vinum 55 locations. While those wine clubs are fun, he said it would be more enjoyable to get together with wine experts to talk face-to-face. Finney created branding for several wineries and tasting rooms in the Verde Valley for the Verde Valley Wine Trail through his company, AZ Communications Group. “I think the thing I enjoy most about wine is the opportunity to get together with people and share the experience,” he said. “Whether it’s reds or whites, there’s such an abundance of really, really credible good wine. Our wine storage is pretty nominal; we abuse our wines and I think having an alternative to be able to do something like with the Vinum experience could be interesting.” Arizona has other wine storage businesses, but they don’t also sell wine and offer all of the other types of services Vinum 55 does, Keyser said. Vinum 55 is open 9 a.m. to 6 p.m. Mondays through Fridays and 9 a.m. to 4 p.m. Saturdays. Information: vinum55.com.